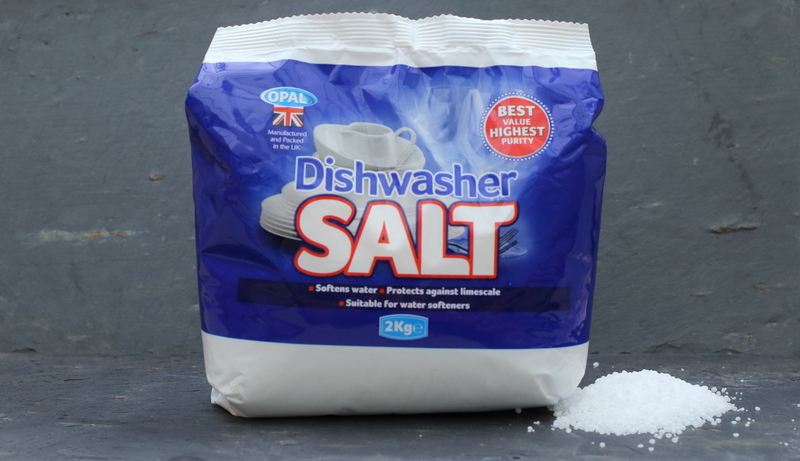 Dri-Pak is the UK's leading supplier of dishwasher salt in the UK, using only salt of the highest purity from Cheshire. Our granular salt ensures that dishwashers and water softening units remain at optimal performance by removing limescale. Find out why dishwashers need special granular salt. Dishwasher salt does NOT enter the wash chamber (a common misconception) - it periodically backwashes the water softener unit in the base of the dishwasher, regenerating it by an ion exchange process, which removes calcium deposits. Dishwasher salt imported from Europe is generally produced from sea salt and has a higher level of impurities. Over time, this could pose a problem for the zeolite exchange unit in dishwashers and water softeners. Dri-Pak supplies its own dishwasher salt under the Opal brand (along with a Rinse Aid) in 2kg bags. If you are a larger customer and require an own brand version, we can offer dishwasher salt in cardboard boxes or bags, available in a variety of sizes and configurations. If you are a retailer or wholesaler and would like to buy dishwasher salt then contact us for pricing and availability, whether it be Opal brand or your own label. Likewise, contact us for a confidential, no obligation discussion on how Dri-Pak can help your business.